I've had two of our readalouds from the summer patiently waiting to be reviewed, and since they both happen to be by Eleanor Estes, it makes sense to review them together. The first one is The Hundred Dresses. Sometimes I choose books for our readalouds that I feel like I should have read as a child but didn't. This was one of those. But even though I had seen it listed on a handful of lists and heard it mentioned by various friends, I must have never actually read a synopsis of it because it was completely different from what I was expecting. It's about a little girl, Wanda Petronski, who moves to a new town and school. Almost immediately, the other children tease her because of her different last name and the fact that she wears the same dress day after day after day (in spite of her claims that she has one hundred dresses). But the story is told more from the perspective of Maddie, who doesn't instigate the bullying but doesn't stop it either. Afraid that if she speaks up, the tables will turn and she will be the one who is picked on, she quietly stands by and lets it happen to Wanda. Her conscience is forever pricked when Wanda eventually moves away, and she never gets to reconcile what she didn't do with what she should have done. This story touched a tender spot in my memory because I have been Maddie. I was in second grade, and I can still remember the boy's name, although I won't mention it here. His clothes and hair and general appearance were always unkempt and his glasses were taped together. Most of my classmates were not nice to him. And although I don't remember ever saying anything mean to him, I never stood up for or defended him either. I have regretted it for twenty-five years. One of the mottos at my kids' elementary school is: "Be an ally. Don't stand by." I think this is so important because the majority of kids aren't the bullies; they're the Maddies. And if the Maddies would call out the bullies and befriend the tormented, it would reverse so many of the problems. Written in 1945, this short story (I wish it had been longer!) was ahead of its time and contains a poignant message that is extremely relevant today. 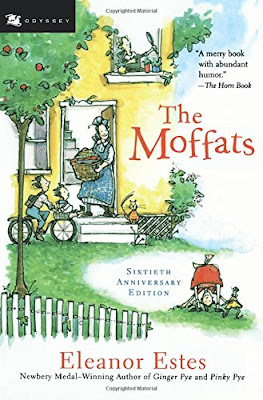 The second book we read by Eleanor Estes over the summer was The Moffats. It has all of the charm of an old story while losing nothing in terms of adventure and escapades. We loved the chapter where Janey marches behind the chief of police, copying his every move, until the neighbor boy tells her she could be arrested for that, and so she spends the rest of the day hiding in a bread box. Another favorite was when Rufus accidentally plays hooky on the first day of kindergarten. It wasn't his intent to skip class (he's been dreaming about going to school like his older siblings for years), but when another little boy sneaks out of the classroom, Rufus feels duty-bound to bring him back, and things escalate from there. Some of the chapters were a little more serious, like when Joe is sent to buy coal with the last money they have until Mama finishes an order of sailor suits (she's a seamstress). (At one point, Janey asks, "Are we poverty stricken?" and Mama answers, "Not poverty stricken, just poor." They're always pinching to make ends meet.) When Joe arrives at the coal yard, he reaches into his pocket for the five-dollar bill and can't find it, and my boys and I spent the rest of the chapter in agony with Joe as he desperately searches for that money. But even though the book is fairly episodic, there is a running thread throughout, which is the fear that their beloved yellow house on New Dollar Street is going to be sold. There are three more books in this series, and I think we'll eventually read the rest (although Aaron already beat us to one of them and read Rufus M. on his own soon after we finished this one). They're the kind of books that could be spaced out and revisited whenever we feel like we need a cozy, comfortable read. Probably because I have two boys I always love hearing about boys loving books with girl protagonists. There's an idea out there that boys won't read books about girls, and it just was never true about my guys, yet I'd find myself sometimes hesitating to offer them "girl books." We read some of the Moffat books but I don't think I ever did One Hundred Dresses although I love it. So it's delightful to hear that your crew also bucks that stereotype. 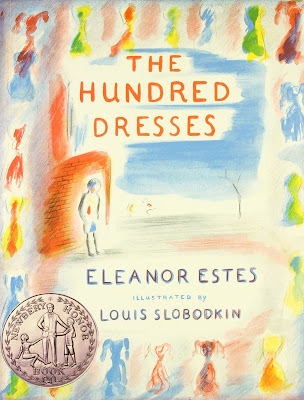 My mom read The Hundred Dresses to me as a little girl and it has always stuck with me. I love that little book and can't wait to read it to Eva! It was a game-changer. Thank you for these reviews! Just tonight my 4yo daughter asked "what if we were poor?" We talked about some of the financial hard times or family has had, but I think The Moffats would be a good read. And the hundred dresses!! I own it! I've never read it! And my second grade son was just telling us about a girl who is teased by the class and how he doesn't want to get involved. His first grade brother told him to "be an upstander, not a bystander" but again I think a story might help here.